North America is a continent. It is located entirely in the Northern Hemisphere and almost completely in the Western Hemisphere. 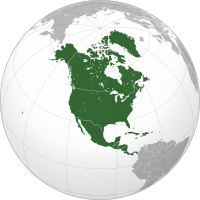 North America has 23 countries and 22 territories. It is bound by the Arctic Ocean to the north, the Atlantic Ocean to the east, South America to the south, and the Pacific Ocean to the west. English and Spanish are the most widely spoken languages in North America. English is spoken in Canada, the United States, and many island countries and territories. Spanish is spoken in Mexico, almost all of Central America (except Belize), Cuba, the Dominican Republic, and a few island countries and territories. French is mostly spoken in Quebec, Canada and French territories. Danish is spoken in Greenland (a territory of Denmark). Haitian Creole (based on French) is spoken in Haiti. Various native languages are spoken by minorities throughout North America. This page was last edited on 7 March 2016, at 18:07.